Director Glenn Weiss did 'an amazing, crazy thing' when he surprised girlfriend Jan Svendsen with a proposal on stage. It was the surprise proposal that stole the show and had Hollywood stars on their feet and wiping away tears when it went down live on air at the 70th Primetime Emmy Awards on Monday night. 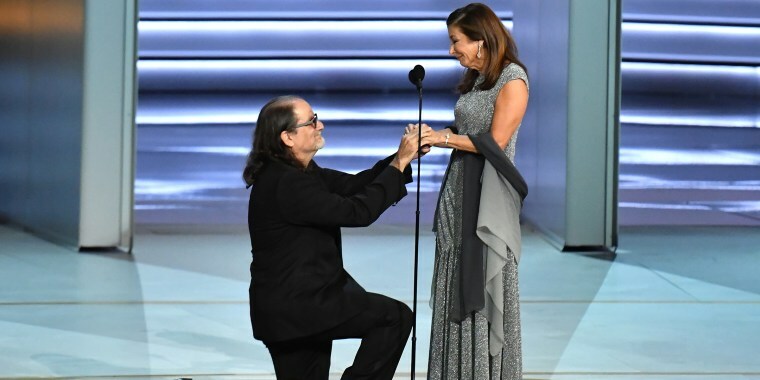 The special moment came when director Glenn Weiss accepted the award for best director for a variety special for this year's Oscars telecast, and then got down on one knee and proposed to his girlfriend, Jan Svendsen. The newly-engaged couple spoke with Natalie Morales on TODAY Wednesday about the moment that had the crowd and the 10 million people watching it on television buzzing. "I still don't really believe it,'' Svendsen said. "Crazy. He did an amazing, crazy thing and here we are. It's really nice that love is trending." Svendsen had no idea Weiss had anything like that in mind. "I expected a very private proposal, if there ever were to be one,'' Svendsen said. "Wait, that wasn't private?" Weiss joked. Weiss dedicated his 14th Emmy award to his late mother, who had died only two weeks earlier, before turning his attention to Svendsen. "Mom always believed in finding the sunshine in things and she adored my girlfriend, Jan," Weiss said on stage. "Jan, you are the sunshine in my life. And Mom was right, don't ever let go of your sunshine. You wonder why I don't like to call you my girlfriend? Because I want to call you my wife." Svendsen burst into happy tears in the audience and then made her way to the stage as Weiss got down on one knee. "I want to put this ring that my mom wore on your finger in front of all these people and in front of my mom and your parents watching from above. Will you marry me?" Weiss asked. Svendsen happily accepted, while many of the Hollywood stars in the audience got up on their feet and cheered. Leslie Jones of "Saturday Night Live" took to Twitter to let any man hoping to be her future husband know that the proposal better go down at the Emmys or "he's just not serious about our love." Two days before the ceremony, Weiss asked his father for his mother's wedding ring, which she had worn for 67 years. "They were never separate,'' Weiss told Natalie about his parents before becoming emotional. "They were amazing, and were deeply, deeply in love,'' Svendsen said. "And the fact I have been able to wear this ring and get engaged with this ring is so meaningful for both of us." The two are still adjusting to their newfound fame, but they are enjoying that it was a love story that has left everyone gushing. Just don't expect their wedding to be broadcast live in prime time. "I think maybe we'll do something a little more private,'' Svendsen said.